Monks at a Devon abbey have defended a fortified wine they produce after it was linked to crime by police in Scotland. 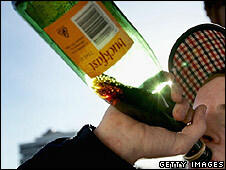 Buckfast Tonic Wine was mentioned in 5,638 crime reports from 2006 to 2009, Strathclyde Police said. The monks said it was "hard to see" how the wine could be "held responsible for all the social ills" of Strathclyde. The possible link between the wine and crime emerged after a Freedom of Information request by BBC Scotland. It was backed by Supt Bob Hamilton, of Strathclyde Police, who said it was "clear from the figures that there is an association there". Has anyone considered that the misuse of this wine by some could be seen as a symptom rather than a cause of such problems? But the monks have issued a statement defending the wine, which its distributors say has just 0.5% of Scotland's alcohol market. It said: "What is clear is that there are serious, social problems in some parts of Scotland and that in some of these parts there are people who abuse alcoholic drinks, including Buckfast Tonic Wine. "Deplorable as these are, it is hard to see how one product with only a small percentage of the market can be held responsible for all the social ills of such an area. "This seems a rather rapid leap of logic. Has anyone considered that the misuse of this wine by some could be seen as a symptom rather than a cause of such problems?" The drink is produced by the monks at Buckfast from imported wines and bottled by a separate company, J Chandler, in Andover, Hampshire. According to researchers, each bottle contains 281mg of caffeine - the same amount as eight cans of coke. Catherine Stihler, a Scottish Labour MEP, has called on the European Union to ban Buckfast and other drinks that combine alcohol and caffeine. She said: "Many consumers are unaware of the damage they are doing to their bodies." But South West Conservative MEP Ashley Fox said banning Buckfast would "destroy years of Devon heritage". He said: "Do people honestly think that if Buckfast wine is banned, hooligans will start drinking tea?"